Etixx - Quick-Step has announced the selections that will participate in the Giro d'Italia. Giro d'Italia, the 3,486km opening Grand Tour of the 2015 season, starts on Saturday, May 9th, and ends on Sunday, May 31st. There is one individual time trial, one team time trial, seven sprint stages, five medium mountain stages, three medium mountain stages with a summit finale, and four high mountain stages with a summit finish. The race opens with a 17.6km TTT in San Lorenzo Al Mare Sanremo and there is also the Stage 14 ITT, 59.4km in distance, from Treviso to Valdobbiadene. There are also two rest days. The shortest stages are Stage 3 Rapallo-Sestri Levante and Stage 17 Tirano-Lugano at 136km each, and the longest stage is Stage 7 Grosseto–Fiuggi, at 236km in distance. A total of 43,000 vertical meters are climbed during the three weeks of racing. 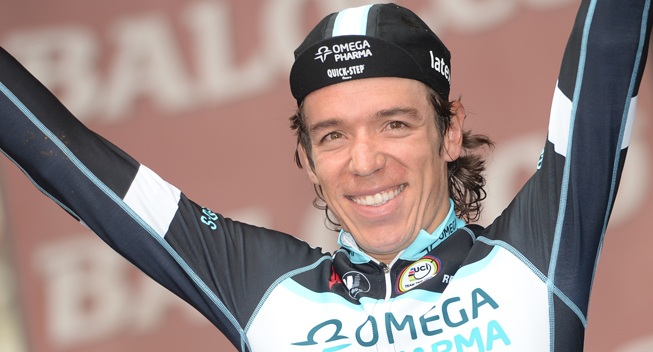 Rigoberto Uran will be the designated leader of Etixx - Quick-Step, after finishing 2nd overall in the 2013 and 2014 editions. He won the 2014 Stage 12 ITT, from Barbaresco to Barolo, which put him in the Maglia Rosa for several stages. Tom Boonen will also participate for the first time in his career, returning from injury after a crash at Paris-Nice. The selection is strong, and also balanced. The remaining selection for Etixx - Quick-Step: Maxime Bouet, Pieter Serry, Gianni Meersman, Fabio Sabatini, David De La Cruz, Iljo Keisse, and Petr Vakoc.